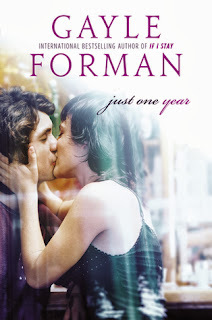 In my review of Just One Day, you may remember that I was essentially straight-up in all the ways dying to read Just One Year like right now Gayle Forman you give me this book and you put it in my hands omg WHY. In other more word-like words, I was desperate to know Willem’s side of things as soon as humanly possible. By some manner of magic and/or witchcraft, I managed to snag an advance copy of Just One Year, and I was over the moon about it! However, I committed the cardinal sin of reading—in a fever to answer my questions, I skipped to the end. I KNOW; I am a terrible person. While I’ll try my best to be NO SPOILERS about this, my original feeling was, oddly enough, disappointment. Over the past few months, I wondered and figured and hypothesized and decided exactly what I wanted from Willem’s point of view. This no-context, just-the-destination ending wasn’t the book I wanted. Thankfully, it ended up being the book I needed instead, and we all know that is SO much better. Upon finishing the entire novel, I had this incredible urge to cry. Or laugh. Possibly both. Together. I felt sated in a way I didn't think I would be when I began. The journey itself is the important part, and the destination isn’t nearly the endpoint. Books—or rather, good books-- teach that in theory, but this duet of stories does that more than anything else I’ve read before. It is its own double happiness. It's very nearly overwhelming, so many times over. Gayle Forman is a spectacular storyteller; she continues to blow me away with each and every novel. There are many who won’t agree with me, but while I found him to be an interesting character, Willem de Ruiter wasn’t one of my Book Boyfriends. He was a little too sure, a little too sad, a little too… something I couldn’t place. I could see why Allyson was drawn to him, though. While I read, my previous feeling still applied, but (obviously) it’s clearly understandable why he is the way he is. Willem and I both learned the power of perspective, almost simultaneously. Willem is a runner, all in the name of keeping his thoughts on the move rather than standing still. We soon discover why Willem wants to travel to every nook and cranny of the globe, and I can’t say I blame him. However, whenever he stops, he sees Lulu’s face. He enlists a cast of hilarious characters to help him on what he thinks is an impossible quest—find Lulu, the only girl who has stained him. It’s in the movement and the journey that he discovers what he’s really looking for, and I wouldn’t dare spoil that for you. In case it isn’t clear, I adored this book just as much, if not more, than its predecessor. I can see many rereads of this in my future, including a dueling POV reread that will most likely enamor me even more to Allyson and Willem. If the cover says Gayle Forman, then it’s going to be a life-changing read.